Today I got an e-mail from the Massachusetts Society for the Prevention of Cruelty to Animals (MSPCA) that I had to share. Last year New England was slammed with an ice storm that caused mass power outages. I was lucky enough to only temporarily lose power, but many were stuck without it for extended periods of time. The MSPCA was one of the places that did lose electricity, running water, and heat for a time and had no generator to supply temporary power. New England is still facing some fairly cold weather and we have had snow storms in April before, so the MSPCA is concerned that in the next few months a power outage may again become an issue. They are trying to raise $77,000, which is quite a feat, but they do have some help. A generous donor will match donations and give up to $35,000 toward the generator, so every little bit counts. The $15 that I donated turned into $30 thanks to the generosity of this anonymous animal lover. The Nevin's MSPCA has raised about 50% of the money for the generator, and with the help of other kind people, hopefully they will obtain the money soon. If you would like to help, click here for information on donating. 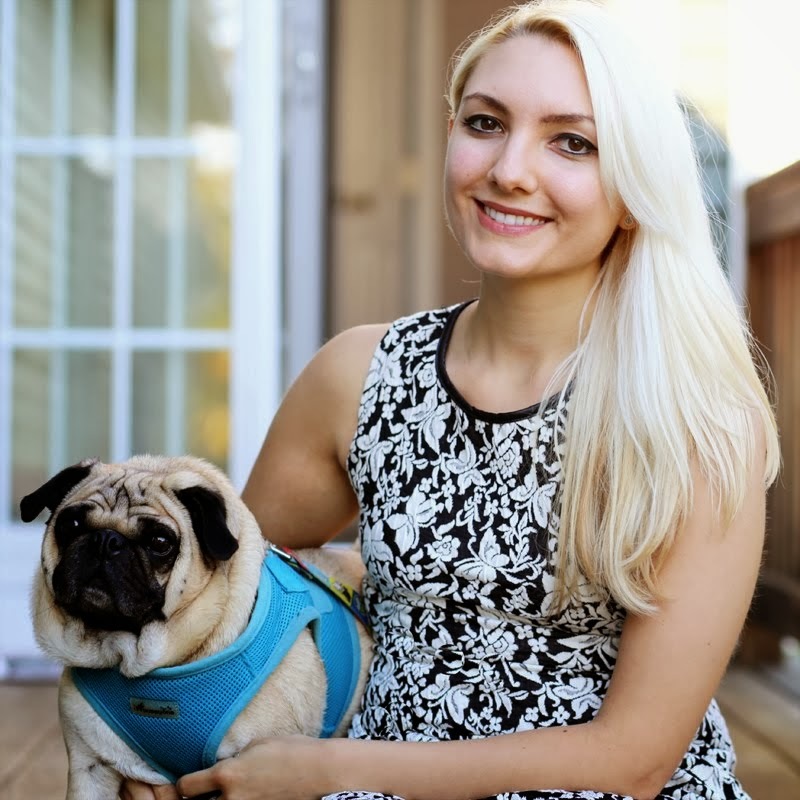 Also, $1 from every purchase from my shop goes to the MSPCA or The Pug Rescue of New England, so you can donate that way as well. Today I have decided to highlight items from Etsy shop owners who also open their hearts and donate a portion of proceeds to help animals. This stray kitty is the most photogenic little wanderer that I've ever seen. Art by Aquarius will donate 50% of the proceeds from the purchase of this card to the Maui Humane Society, in honor of this little cutie who was dubbed "Hana" by the artist. This charm is made from polymer clay and hand stamped with love to adorn your pup's color. 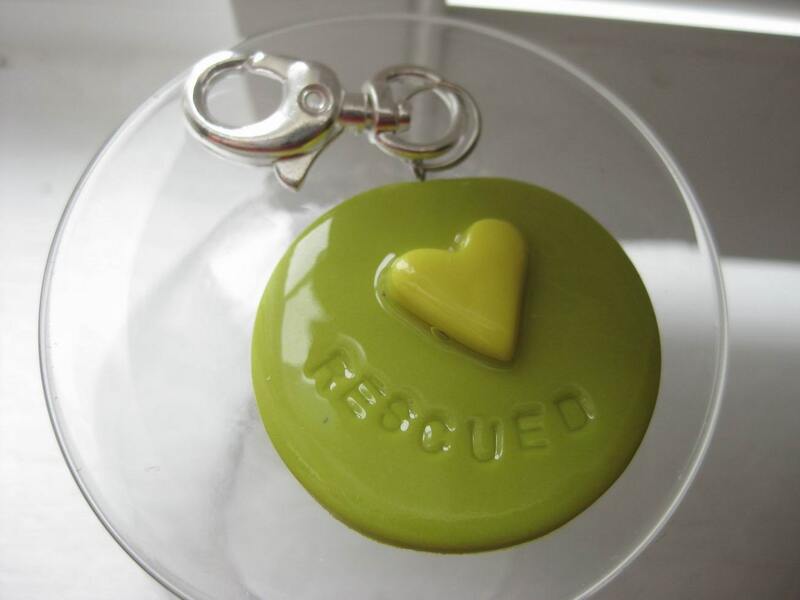 This bright accessory will remind you of just how sweet it is to bring a rescue into your home. 10% of the profits from this item go to The Animal House Fund, a non-profit organization that is striving to build a new animal shelter in St. Louis, Missouri. Mod Creations offers many cute charms in their shop, so if green isn't your color, be sure to visit the shop and find a charm that suits you and your pet. 100% of the proceeds from this toy go to Purrfect Partners Cat Rescue. That's right, 100%. A Cat's Dream portrays generosity at its best. 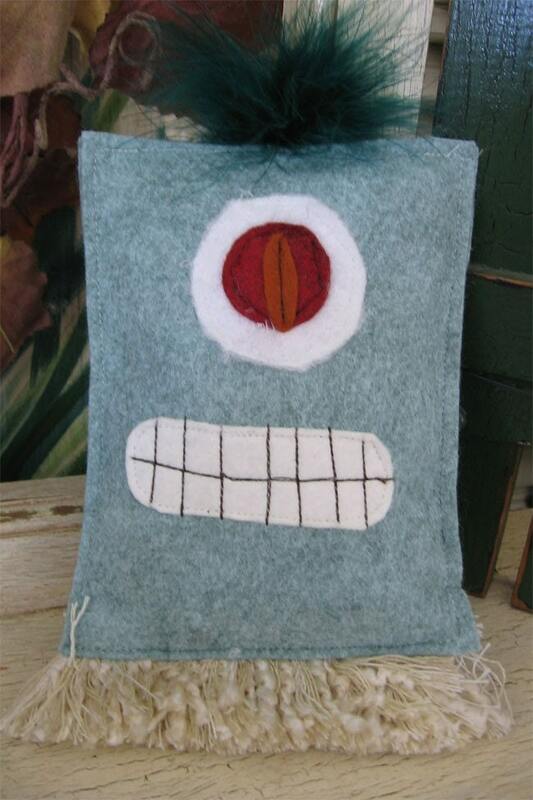 This funky catnip-filled toy will give your own cat or kitten a fun new toy while also helping other less fortunate kitties find lovely owners like you. This print is cute and quaint. It is about the size of a baseball card and the artist has several available that you can collect. This ACEO is a reprint of the artist's original work. 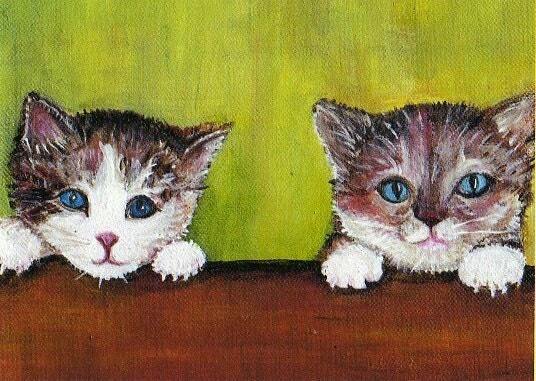 All proceeds from these little cards go to Cedarhill Animal Sanctuary in Caledonia, MS. Purchase this dose of double trouble and find other pieces by Sharon Foster in her shop. Scrappy Rat Designs is a member of Etsy for Animals which means that 100% of the profits from these cookbooks go to animal rescues and advocacy groups. 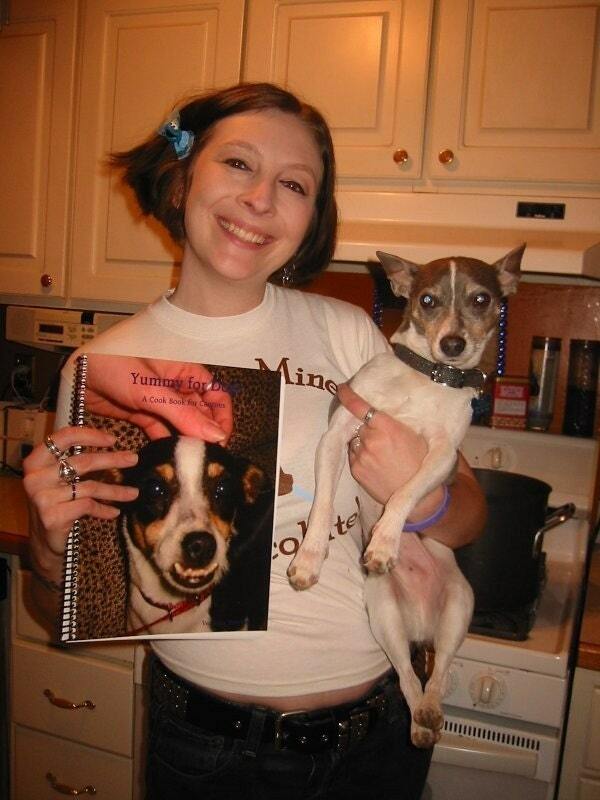 The book contains over 100 recipes for your playful pooch and even has information on how to adjust recipes in the event that your pup has allergies or is sensitive to certain foods. I think that I may have to get one of these so that I can concoct some yummy goodies for James Dean! 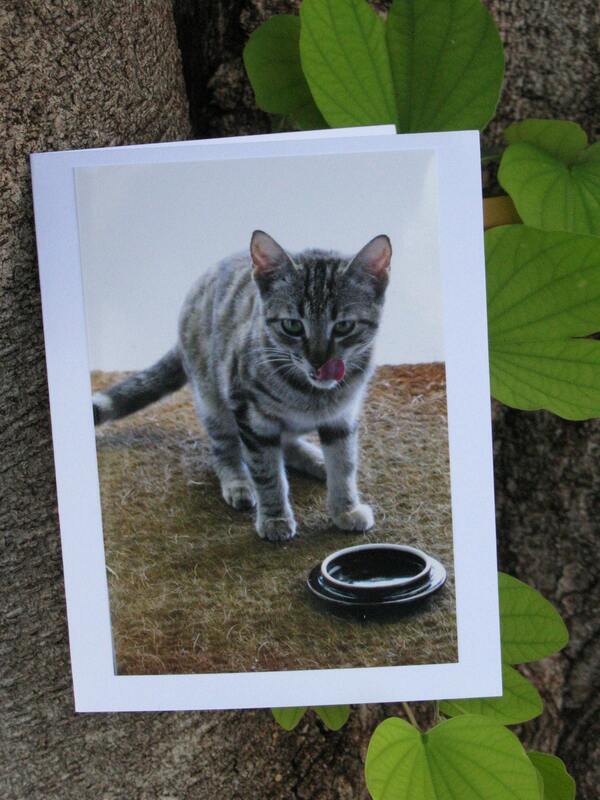 This handcrafted bowl is imprinted with a print from the paw of an abandoned cat who is now adopted and safe. 20% of the proceeds from this item go to Somebuddies,Inc, a home-based shelter that provides a safe place and care for cats in Virginia. Visit Kristen's Clay for lovely handcrafted pottery. This earth, wind, and water pendant is a gorgeous gift for yourself and an even better gift for the animals that you will be helping through your purchase. 100% of the profits go to The Lakes Area Humane Society in Missouri. The Going to the Dogs Shop donates all profits from every item to this shelter. Shelters have taken in so many animals due to the poor economy that has prevented many people from being able to afford pets. Animals need love, support, and a home. This shop helps to give them that hope. Another shop that donates 100% of the proceeds from items to a shelter! All of these kind people make me smile today. Whiskerkisses is another member of Etsy for Animals. 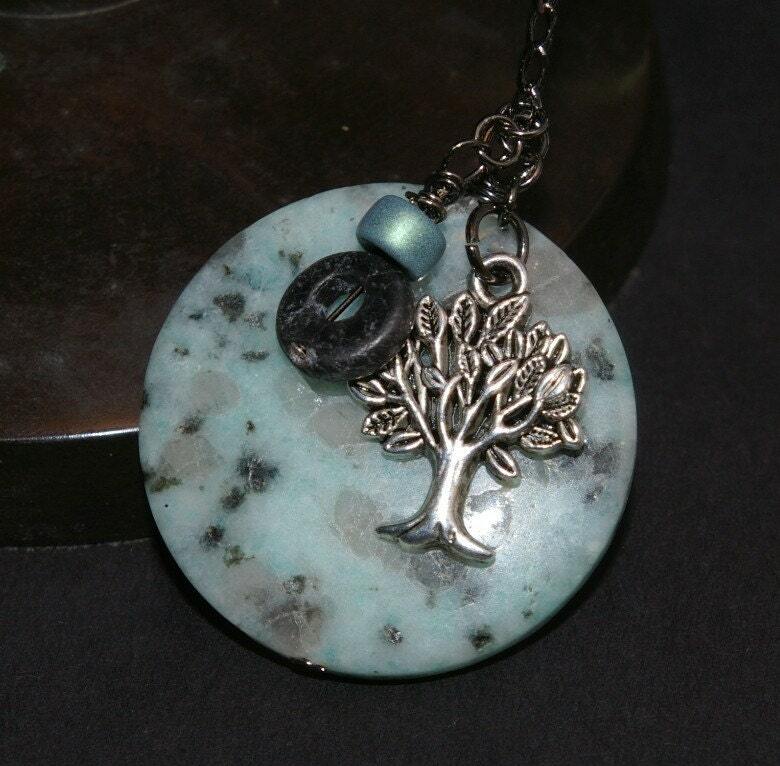 The proceeds from this item go to the Animal Welfare Society of Southeastern Michigan. J.D. 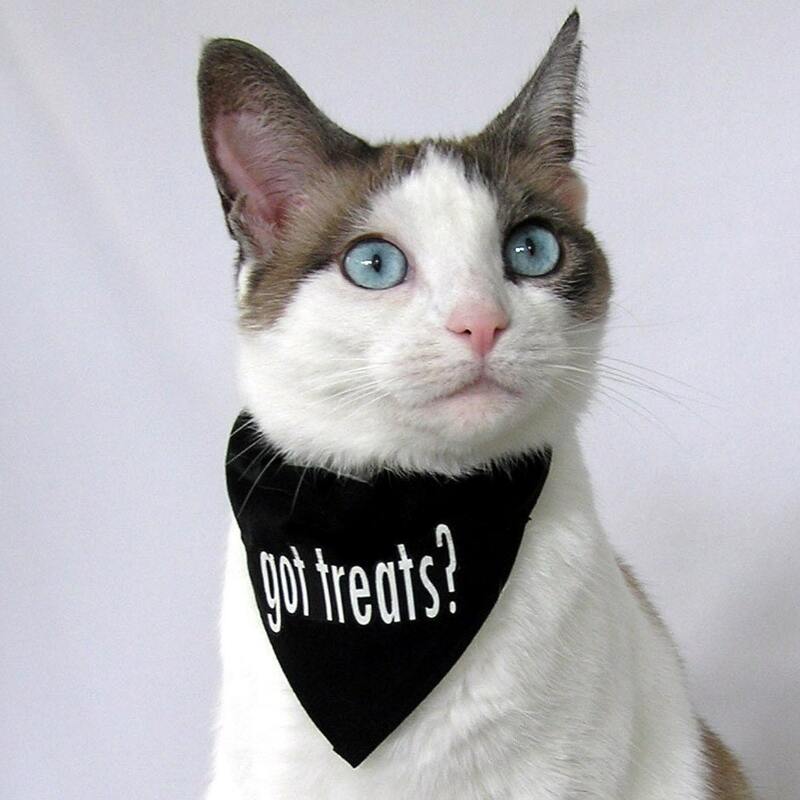 is always begging for treats, now he and his furry friends can say exactly what they are thinking with these accessories. Look at that face! Help other cuties like mine find health and a good home today! Thanks for featuring my cookbook! Any opportunity I have to help out animals is a good thing.